brinjal fry recipe | brinjal rava fry | baingan rava fry | fried eggplant with detailed photo and video recipe. 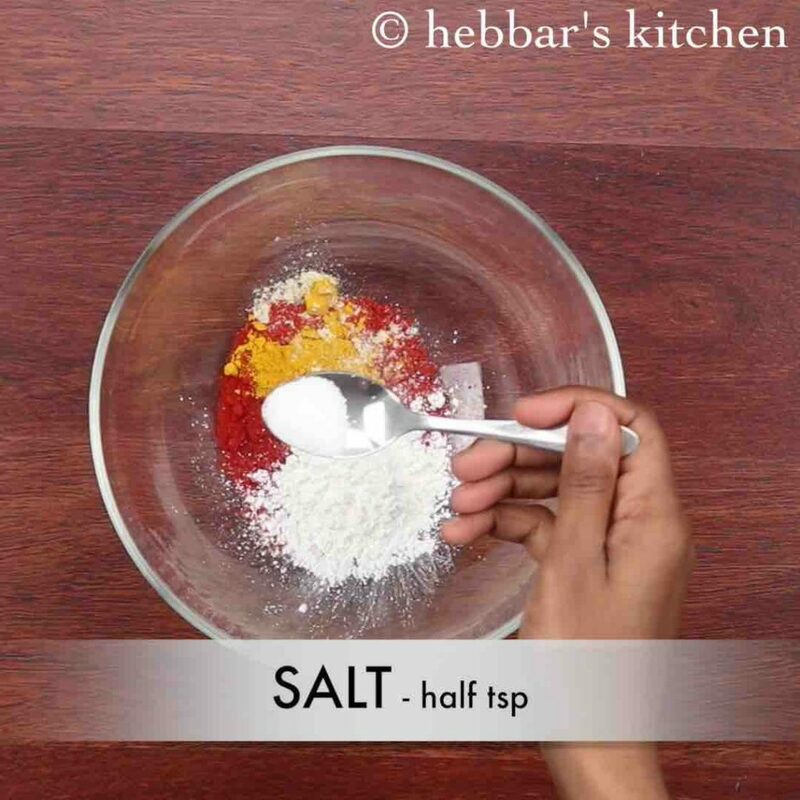 a tasty accompaniment for dal rice or sambar rice and can also be extended to roti or chapati too. 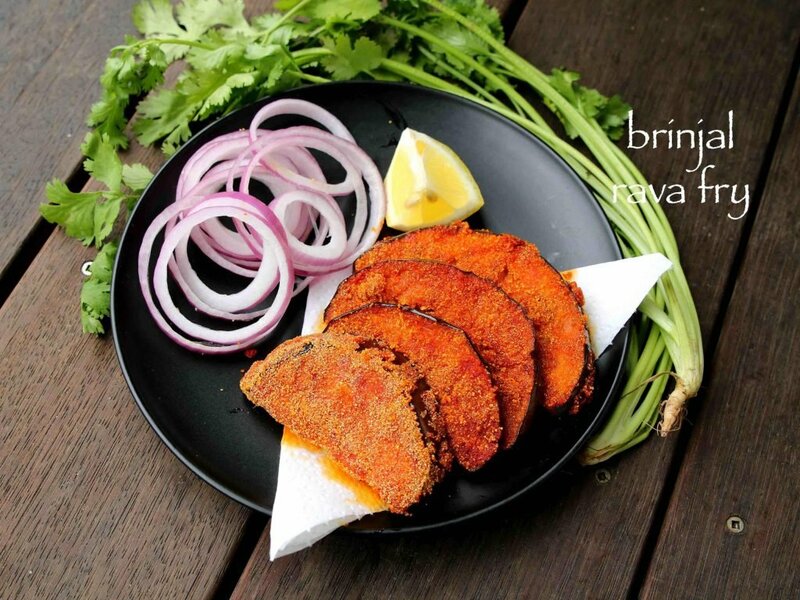 it is an quick and easy side dish prepared with purple brinjal or eggplant coated with spiced rava and shallow / pan fried till crisp. these semolina coated brinjal fry recipe, can also be served as starters or perhaps as evening snack. brinjal fry recipe | brinjal rava fry | baingan rava fry | fried eggplant with step by step photo and video recipe. 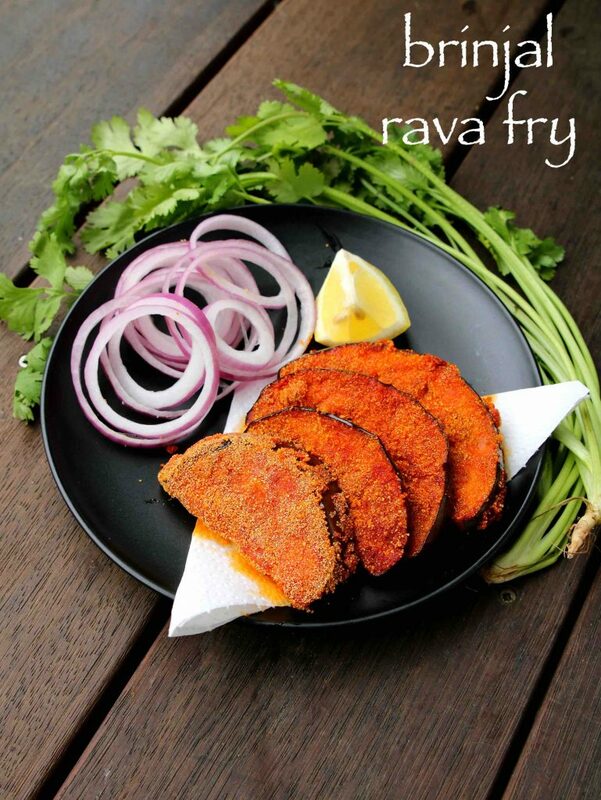 rava fry vegetables are quite popular recipe in south india and eggplant rava fry is one such recipe. 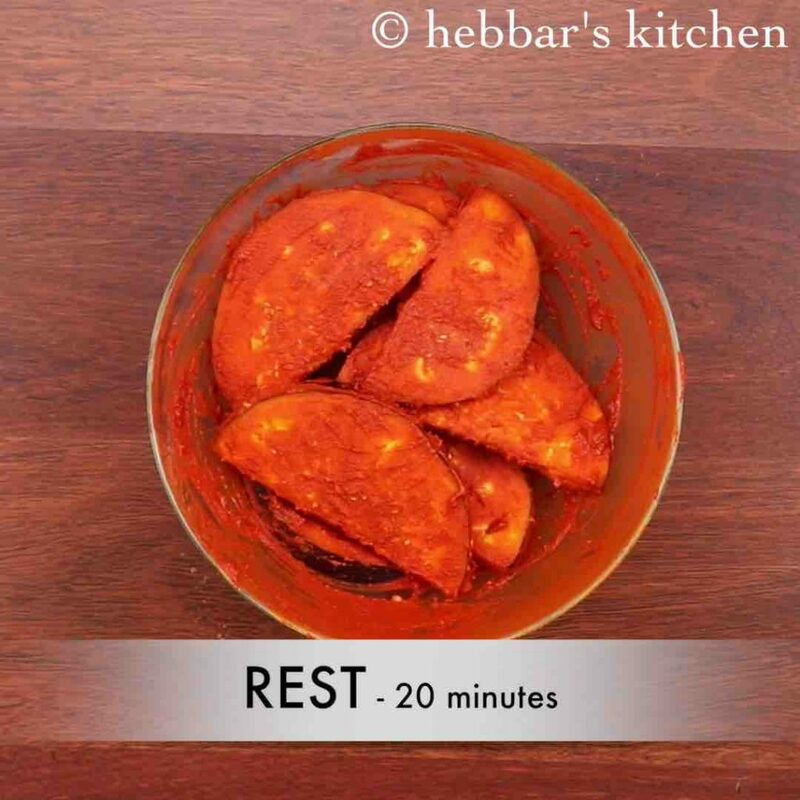 it is also one of the popular side dish among the konkani community from south canara. and it is mainly served after the rasam rice combination. there are several variation to this simple brinjal fry recipe and the recipe varies with region to region. in this recipe post i have shared the konkani community variation which is mainly prepared by coating brinjal with semolina. it is perhaps one of the must recipe for them with their marriage or any festival feast. even with the konkani community, the preparation of brinjal rava fry can vary. 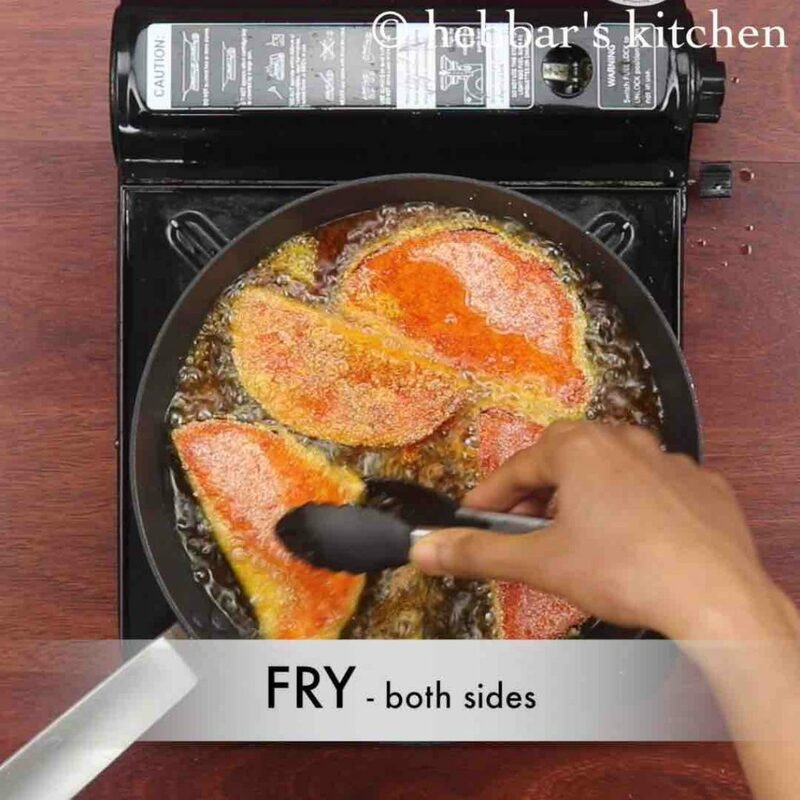 the variation is mainly with the frying and it can be either pan fried or deep fried. deep fried are more tasty and easier and hence the most preferred option in celebration feast. whereas the pan fried is more common in households for day to day lunch and dinner. some easy and healthy variation to this simple brinjal fry recipe. firstly, slice the brinjals uniformly and marinate for atleast 20 minutes. also do not keep flipping baigan as it doesn’t have so much strength and may break. finally, use fine variety of sooji, else the rava will not look pleasant when served. 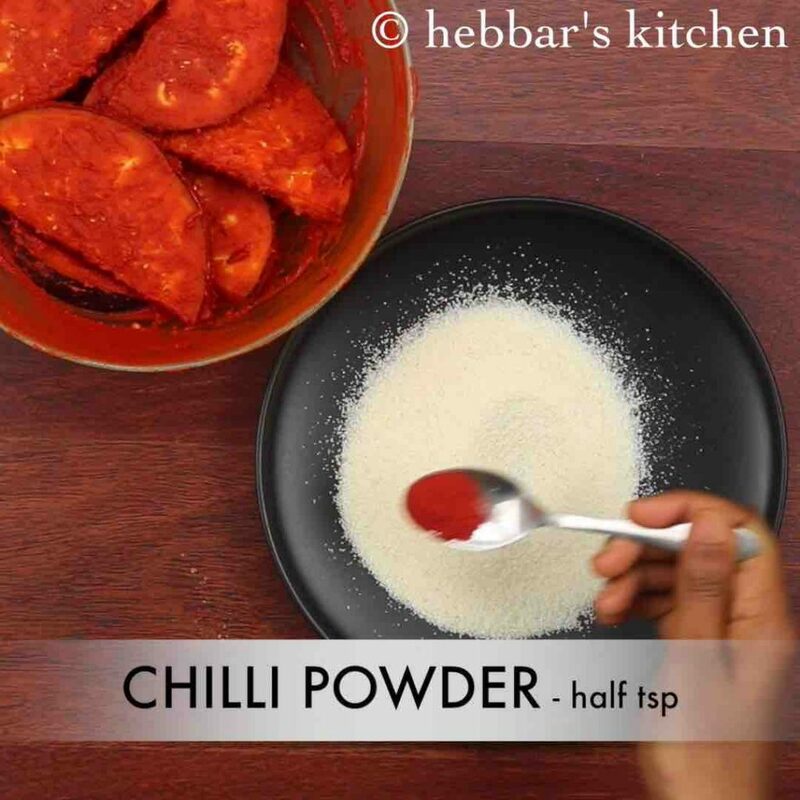 firstly, in a large mixing bowl take 1 tbsp chilli powder, ½ tsp turmeric, pinch of hing, 2 tbsp rice flour and ½ tsp salt. combine well making sure the spices are mixed. 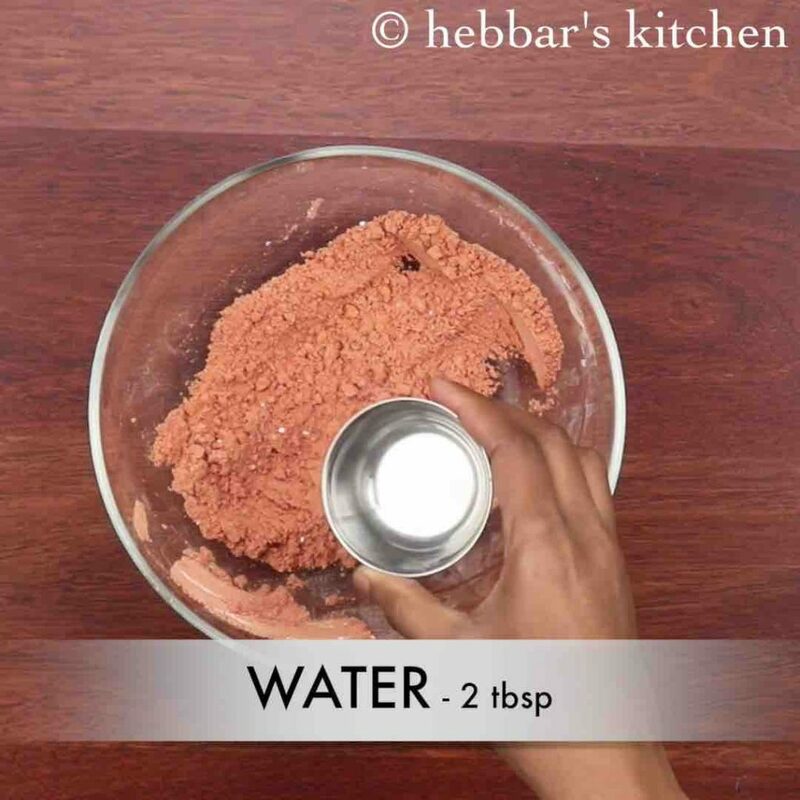 now add 2 tbsp water and prepare a masala paste. 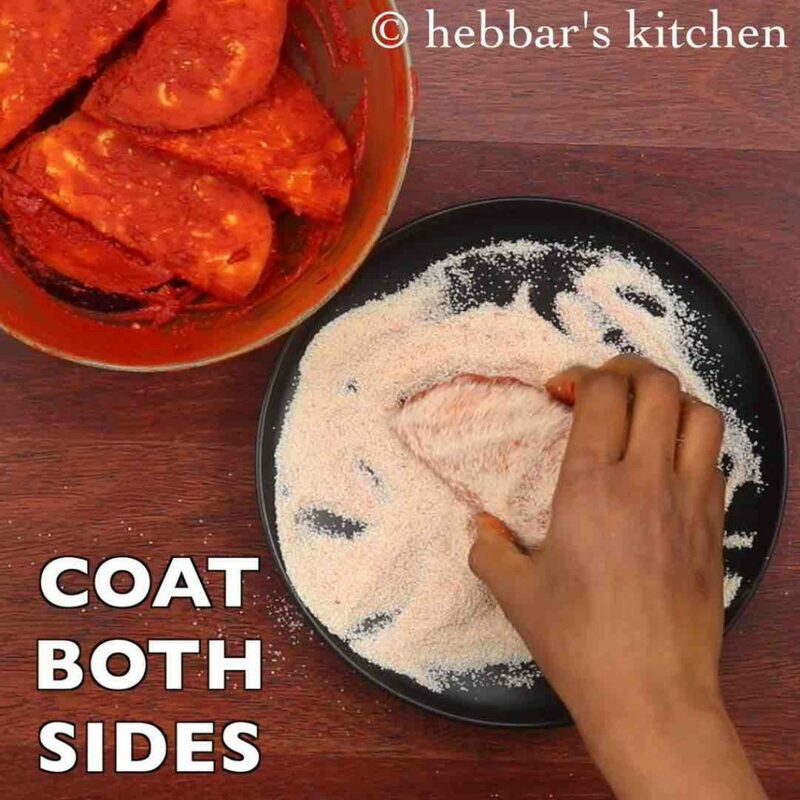 add in 1 brinjal thickly slices and coat with masala paste. coat well and rest for 20 minutes. 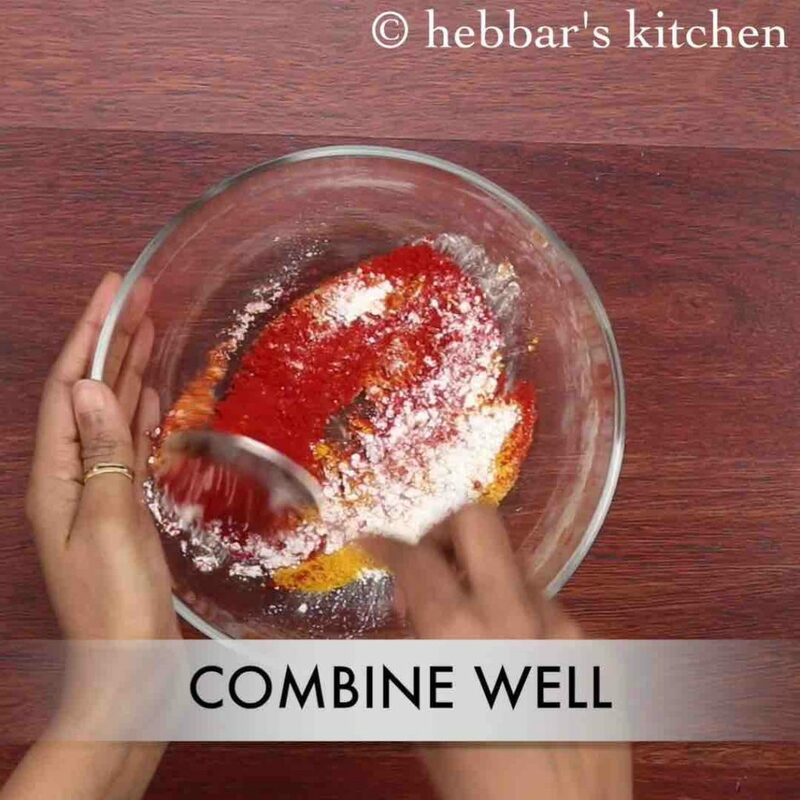 meanwhile prepare rava mixture by mixing ¼ cup rava, ½ tsp chilli powder and ¼ tsp salt. now coat the marinated baingan with rava on both sides. 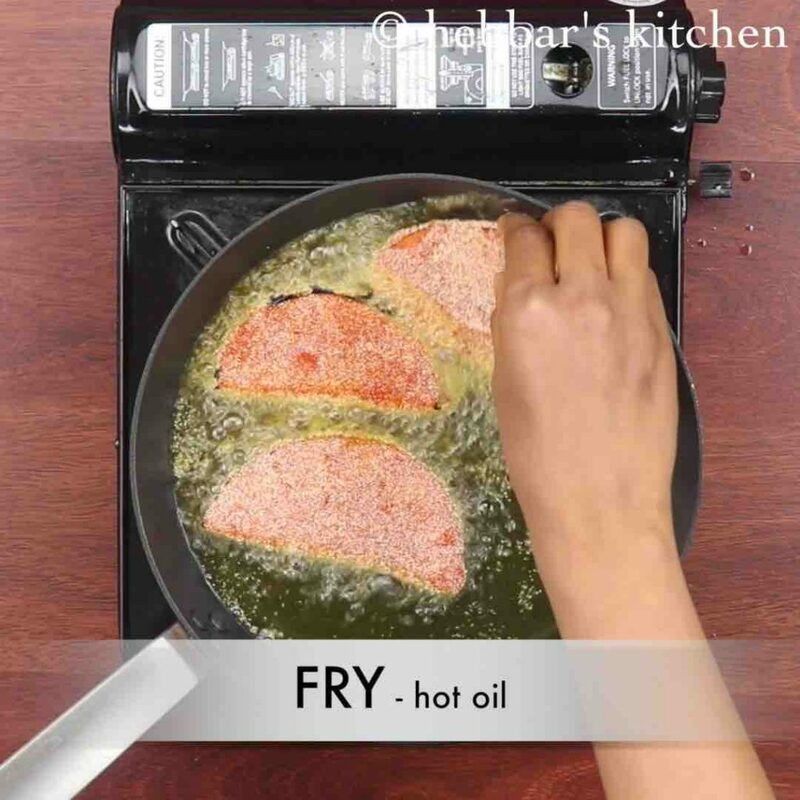 shallow fry or pan fry in hot oil. 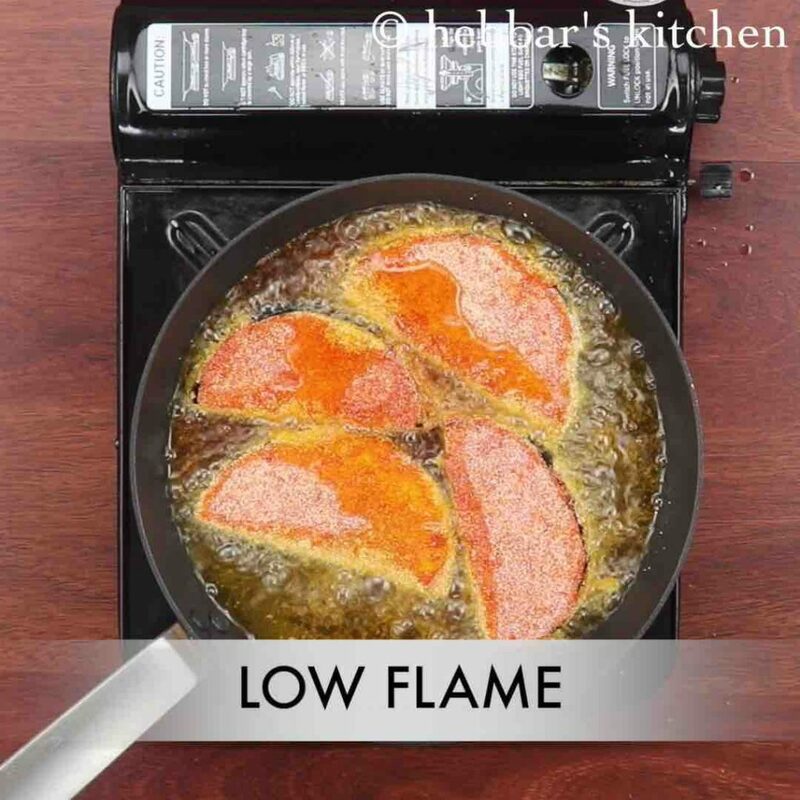 fry on low flame making sure to cook well. now flip over and cook brinjal on both the sides. do not over cook as then brinjal will loose shape. 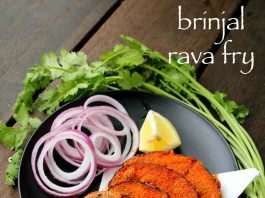 finally, serve brinjal fry recipe / brinjal rava fry as a side dish. 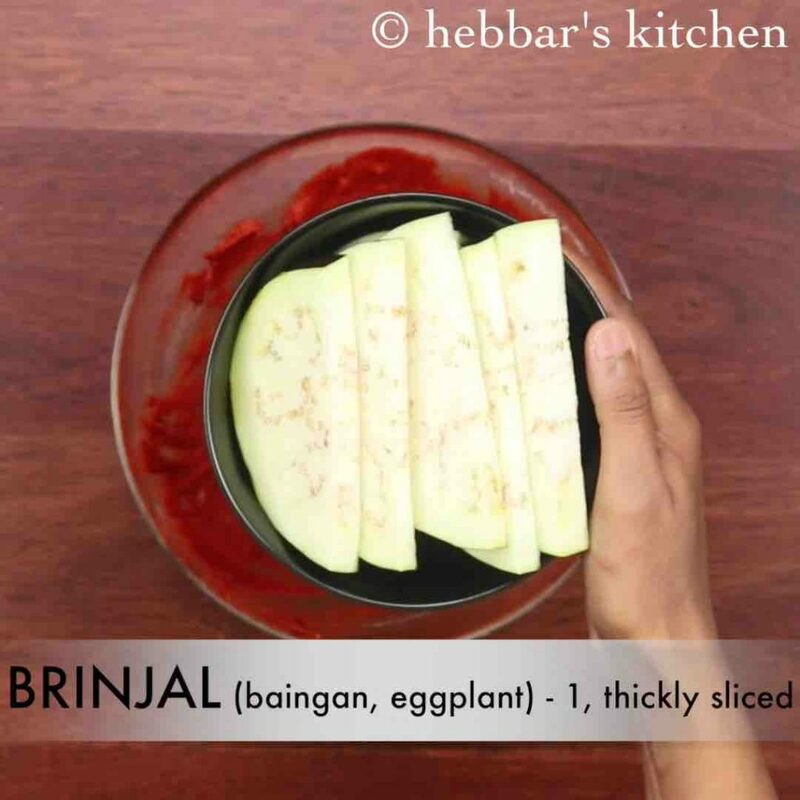 firstly, make sure to slice brinjal uniformly, else they take different time to cook. also fry on low flame, else brinjal will not get cooked from inside. additionally, add rice flour or corn flour helps to get crispy brinjal fry. finally, brinjal fry recipe / brinjal rava fry taste great when served hot. can we bake this instead of frying !?? love ur recipes, can you introduce Air fryer recipes too. Wooooow looks yummmm, love your recipes. its kashmiri red chilli powder..its not spicy..just gives dark red color..